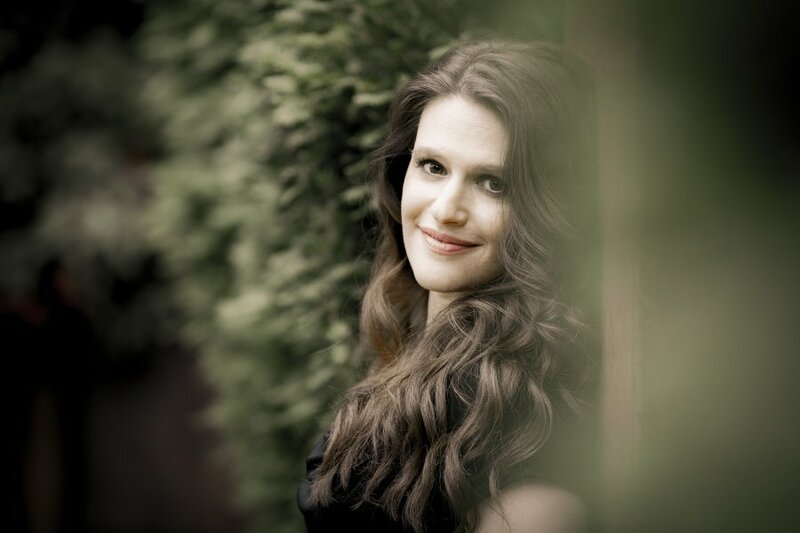 American soprano Robin Johannsen is one of the great interpreters of Baroque opera. This Philadelphia native has spent the majority of her career on the great stages of Europe, including the Berliner Staatsoper, Oper Leipzig, and Théâtre Royal de la Monnaie to name but a few. I am extremely grateful that she was willing to take a little time out of her busy schedule to sit down and talk to us about her exciting career! What is your earliest opera memory? When did you decide you wanted to make opera a career? From the time I was very small, I loved to sing musical theater. From about three years old, although I was always shy, I would stand on the table at family parties and sing. Because I loved listening to the great belters (Andrea McArdle, Ethel Merman, etc. ), that’s how I would try to sing. Only thing is, I don’t have that kind of voice! My mother was afraid that I was going to hurt myself, so she got a wonderful orchestra teacher, Mr. Williams, to give me voice lessons starting at 9 years of age. He introduced me to opera arias like “Caro nome,” (Verdi’s Rigoletto, 1851) and “Der Hölle Rache” (Mozart’s Die Zauberflöte, 1791). I sang them as a child just for fun and to learn to use head voice without ever having any intention of singing opera professionally. I decided that I wanted to be an opera singer in high school when my music and choir teacher, Mr. Braman, gave me voice lessons. He really believed in me and played me the great sopranos like Lily Pons, Leontyne Price, Joan Sutherland, and Maria Callas singing beautiful operatic repertoire. He told me that he thought that I could be an opera singer if I worked very, very hard and was prepared to deal with a lot of rejection and never give up. This appealed to me very much, and I learned to love opera as much as I had always loved musical theater. For those unfamiliar with Baroque opera, how would you introduce the genre? What should listeners listen for in Baroque opera? What kind of instruments will they hear? What kind of arias can they expect to hear? Baroque music is actually quite catchy – the pop music of its day! Many of the arias are in a form called da capo, which means that you sing the first part of the aria, then a middle section which is different, and then you go back and sing the first part of the aria again but this time with variations in the notes. The variations are not written in the music – everyone creates their own. It’s fun to listen to how the singers and orchestra will ornament the music and make it different the second time through. Baroque music is also interesting because it is often left to the conductor to decide what instruments will play which arias and especially the recitatives. This means that if you see a production of the same baroque opera in two different opera houses, it will sound completely different not just because of the singers, but also because of the instrumentation. You will hear many of the same instruments that are played in classical and romantic operas, but often they will sound different because they are made differently and even tuned differently. Then, there are instruments that are unique to Early Music like baroque trumpets and oboes, lutes, harpsichords, lirone, viola da gamba, and many more. Baroque music is a different aesthetic from Classical, Romantic, or 20th century music. 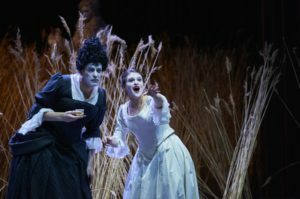 What are the biggest differences between singing Baroque opera and Classical or Romantic opera? The goal is to develop your own idea about how you can bring the music to life, but you can only use the instrument you’ve been given no matter what you’re singing. For me, singing is singing. As singers, we are always striving to improve our instrument and sing as freely as possible. I think the difference comes in the style of the music and how much you are able to incorporate different styles into your singing. If you’re singing Bach with a lot of portamenti (sliding from one note to another), it just won’t sound like Bach no matter how beautifully you manage to do it. Same thing goes for singing Bellini without any portamenti…it’s just not what people are expecting to hear, and it feels and sounds wrong. If it’s a composer that I’ve never sung before, I like to do my homework and listen to the great artists and conductors who have sung/conducted the music that I’m preparing until I feel like it speaks to me, and I understand the heart of it. The goal is to develop your own idea about how you can bring the music to life, but you can only use the instrument you’ve been given no matter what you’re singing. I watched you perform “Traurigkeit” from Mozart’s Die Entführung aus dem Serail (The Abduction from the Seraglio, 1782). First off, brava! What a lovely performance of Konstanze’s aria. One of the first things I noticed about your performance was your register consistency; your voice’s top, middle, and bottom were all fully under your control and seemed to effortlessly obey your command. So often singers excel in only one area of the voice, but that is not the case with you. Do you think this quality of your voice has helped you become a leading interpreter of Baroque operatic roles? First of all, thank you so much! That really means a lot to me because it’s something that I work very hard on. 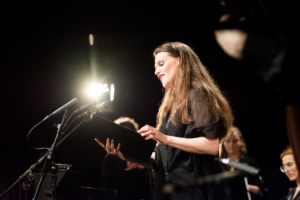 I think that I’ve had a lot of luck performing in Baroque and Classical operatic roles because I’ve worked with such brilliant conductors and musicians who really bring out the best in their singers. I also have a great teacher, Ira Siff, who is passionate about opera, style, interpretation, and putting it all together. My goal is to be so prepared with the technique that I can forget about it when I’m onstage and just try to experience the story from the character’s point of view. In addition to your vast experience with Baroque opera, you are also have a passion for Mozart. How different are your approaches to roles like Konstanze or Fiordiligi (Mozart’s Così fan tutte, 1790) from those to Baroque soprano roles? I approach the preparation the same no matter the composer, but with Mozart or later composers, I can sing more freely in terms of my natural vibrato. The aesthetic is different, and as much as I love Baroque, it is a real pleasure to sing with the whole natural instrument! Do you have a favorite role? Is there one that seems to fit you and your voice perfectly? Playing strong but flawed women is my favorite! One of my favorite roles is Emma in Telemann’s Emma und Eginhard. This role is so beautifully written – the music and also the content. Emma’s emotions are so strong, and I felt like I could really lose myself in her. I had similar feelings about the role of Isifile in Cavalli’s Giasone. Playing strong but flawed women is my favorite! You have performed all over Europe and the U.S. Do you have a favorite house to perform in? Does one feel like home? For the last three seasons, I’ve sung a new production each season at the Berliner Staatsoper (im Schillertheater). This is a great joy for me. Having lived in Berlin for many years, it’s long been a dream of mine to sing at the Berliner Staatsoper! It’s also only a twenty minute walk from my apartment, which means that I can run home between rehearsals and have a meal with my family. Next season, the Berliner Staatsoper is moving back to its permanent home, Unter den Linden, and I’m thinking that that might just feel like home, too. After all, it’s just on the other side of town! I want to end with a question I ask nearly everyone: what is it about opera that touches your soul? I really love how great music can transport you and make you feel like you’re a part of something that’s so much bigger than yourself. There’s a magic that can happen when the music and drama combine that makes you remember that you’re not alone. Whatever you are going through, there are people who have had the same feelings. Whether I’m in the audience or on the stage, when this magic happens it fills me with hope and makes me grateful to be alive.